Traveler Reviews for Private Tour in Boston, Massachusetts, United States by Tour Guide Peter B. TOUR GUIDE RESPONSE: Thanks, Debbie! We were thrilled with our visit to Boston with Peter as our guide! We covered so much during our one day in port; he took us to all the sites we'd heard about. Peter was so informative, friendly, and fun; we felt like we were riding with a longtime friend! From Fenway Park--to the historic sites along the Freedom Trail--to the Cheers Bar---to the JFK Museum, and everything else we had on our list...Peter made sure we saw everything we had hoped to see and more! Thank you Peter! I had a splendid, inciteful, educational, entertaining and edifying tour by Peter. It was a customized tour bespoke to my specification and Peter came through, well-prepared and fascinating. This is a fabulous tour of the Concord/Lexington are. Peter is very knowledgeable with the historical facts. Our day was terrific. Plus Peter rearranges the schedule to allow visitors to se some sights that they really have been yearning to see. Thanks.! TOUR GUIDE RESPONSE: Thanks again! TOUR GUIDE RESPONSE: Thanks! I appreciate the kind words! Our group of 8 had a fantastic tour. Peter is very knowledgeable and a great driver. He accommodated our traveler that had some mobility issues very well. He has a very pleasant personality. TOUR GUIDE RESPONSE: Thanks, Celinda- yours was a fun group! Peter was perfect in every way! Comfortable city tour on a snowy day for myself, my husband and my adult daughter. He covered every neighborhood, stoppped numerous times for photos and entertained us with a constant stream of history and current culture. I highly recommend him!!!! TOUR GUIDE RESPONSE: Thanks, Gary. It was good to meet you both! Peter was terrific- professional, relational, informative! Worth every penny. Thank you Peter! We all enjoyed hearing so many little asides along with so many interesting AND fascinating facts! You are a great driver, too! TOUR GUIDE RESPONSE: Thanks Lisa! I would do another tour with Peter anytime I am in Boston. He was thoroughly engaging to my young adult son and I - he adjusted the sights and information given according to our interests, and was able to answer our questions on a huge variety of topics. In between the obvious sights, he would tell us background stories of buildings, statues etc along the way. He was the best guide ! TOUR GUIDE RESPONSE: Thanks, Winnifred, for the nice review. It was a pleasure meeting you both! Great tour by a super informative tour guide. Peter is so knowledgeable about the Boston area & really covered everything we wanted to know & more. Would definitely recommend this tour guide & his tours. TOUR GUIDE RESPONSE: Thanks for the nice review-- I enjoyed showing you around. Peter B. is a fantastic guide with a wealth of historical knowledge. If visiting the Boston area, this tour is a must. Thank you Peter! TOUR GUIDE RESPONSE: Thank you, Cynthia! If possible would give rating of 20. Peter is extremely knowledgeable re: Boston. He was pleasant & considerate + a safe driver. We were impressed with your company. Thanks for a fab tour Peter. TOUR GUIDE RESPONSE: Thanks, Lynn! It was a pleasure to have you here! Peter is the most descriptive tour guide we have had on a city tour. I could not have been happier. He took us everywhere we wanted to go, and some places we weren't even aware of. My son even had a question about Harvard that he wasn't able to answer on the spot, and he got back to us after the tour with the answer! Above and beyond! Highly educated, fun and informative. We will be seeing him next time we come to Boston for the surrounding tours, Thanks Peter! TOUR GUIDE RESPONSE: Thanks Manuel- I hope you all had a great trip! TOUR GUIDE RESPONSE: Thanks for the stars, Harold! TOUR GUIDE RESPONSE: Thanks Lindsley- I appreciate you and your group taking my tour! January 9, 2016 myself and friend took the Boston Experience tour. We had a great time. Our driver Peter B. was extremely knowledgable about the city. I am a local resident and my friend was from Maine and had never been to Boston and wanted to have a tour. He was also amazed at how well Peter also could maneuver the city streets. I would recommend to anyone to take this tour if you really want to see Boston and learn it's history. We both give the tour a 5 out of 5. TOUR GUIDE RESPONSE: Thanks Maureen! I hope you both had a wonderful time here. (Pet the dog for me!). A very knowledgeable and careful guide. we throughly enjoyed our day. Very informative and flexible tour. TOUR GUIDE RESPONSE: Thanks, Lorene! TOUR GUIDE RESPONSE: Thanks, Lou! You were a fun bunch! Peter was super! How could one person know so much about a city the size of historic Boston? Very informative, on time and maded sure we saw or visited everything we asked. Just wish our ship would have been on time! My only criticism would be.....he's a Red Sox fan! Thanks Peter for a job well done and GO CARDINALS!!! TOUR GUIDE RESPONSE: Thanks again, Ramona-- and very best wishes to you and Dave! Peter is simply the best tour guide I have ever experienced. He gets 6 stars and 3 thumbs up! Don't experience Boston without him! Peter provided an exceptional experience. He was knowledgeable not only about the history of the area, but also the cultural and political insights of the events. We were able to see more than would have been possible on a bus tour. His knowledge of the architectural history of the area provided an important perspective to truly appreciate the beauty of Boston. Absolutely fantastic tour! 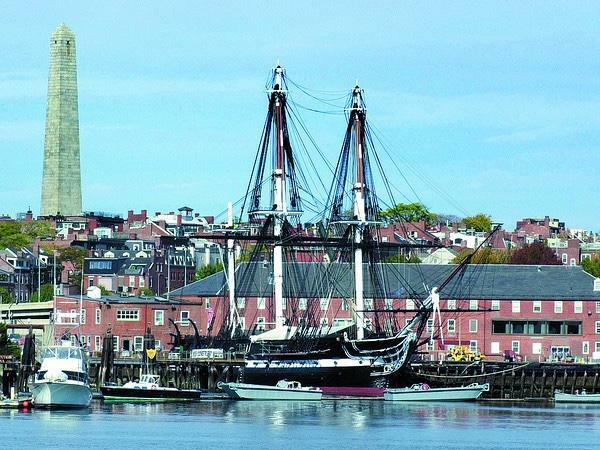 A great way to experience the history of Boston. Peter has an extensive knowledge of the city and provides many insights. Highly recommended, Peter went out of his way to modify the four hour itinerary to suit our needs and interests. TOUR GUIDE RESPONSE: Thanks, Frank! It was nice to meet you and your family. I hope you had a great Christmas week in New York! Peter was great and right on time. Peter was extremely knowledgeable and gave an excellent presentation about Boston and the history. Peter is great tour guide and an asset to your company. TOUR GUIDE RESPONSE: Thanks, Joe-- I had a good time with your group! We were a family of six (6) and did The Boston Experience with Peter. Peter met us at our Cruise Ship and it was our first time in Boston. Peter was a great Guide and really knew Boston and it's History. We learned so much and really enjoyed touring with him for the day. Our one request was to go to Hingham and have lunch at Wahlburgers. After seeing Boston we headed out to Hingham for lunch which we all enjoyed. We highly recommend Peter as a Guide. Thank you, Peter, for a great tour and great day! TOUR GUIDE RESPONSE: Thank you, Eileen, I had a nice time with your family and now that I've been to Wahlburgers, I might just go back. And I'll definitely drop in to Scotori's for pizza if I make it to Myrtle Beach! We have had many private tours and Peter is one of the best. His calm and conscientious manner made for a well paced tour and showed in his driving. He's very knowledgeable, listens, and answers questions. The tour was fun - Perter's sense of humor wqas very enjoyable. TOUR GUIDE RESPONSE: Thanks for the nice report, David. I like all of my guests, but you and Liz were standouts! I hope the rest of your New England trip was enjoyable. Very knowledgeable with comfortable presentation. We really enjoyed our day with Peter. TOUR GUIDE RESPONSE: Thanks,Jon- I'm so glad you enjoyed yourselves! Informative but seeing a city out a car window for 5 hours is not my favorite way to sightsee. TOUR GUIDE RESPONSE: I'm sorry you were uncomfortable, John. Maybe you shouldn't have booked a driving tour. Peter was great. He picked us up at the hotel right on time and took us to Salem first where we toured the city and visited a Salem witch museum. After lunch it was off to Lexington and Concord. He was very knowledgeable and fun to listen to. We had a large group of eight people including a two year old and a seventyfour year old. We were able to do everything at our pace. I am recommending using Tours By Locals to everyone. Peter was delightful company, well informed and responsive to our interests. Great tour guide! Peter was very knowledgeable. My husband and I are history geeks and we were very pleased with his knowledge of Boston. We would definitely recommend him. Peter was very knowledgeable and flexible to our needs. The private tour was a bit of an extravagance for us but was money very well spent. TOUR GUIDE RESPONSE: Thanks, Jay! It was fun for me too! My tour was just great!